The M170 FPD monitor is offered with proven touch screen technology from 3M Touch Systems. MicroTouch ClearTek capacitive touch technology provides accuracy and sensitivity to the user's touch while offering outstanding durability. ClearTek provides scratch resistance and contaminant-resistance to dirt, liquids, and harsh chemicals. MicroTouch Resistive 5-wire touch technology provides fast, accurate, and reliable touch when input flexibility is the most important consideration. All monitors ship with cable and power supply. 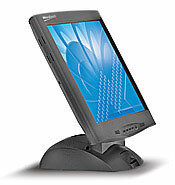 The 3M Touch Systems 41-91375-225 is also known as 3M MicroTouch	MCT-4191375225	or 4191375225	.